Calendar Spreads are a popular low risk, high profit potential, alternative for traders who believe that an underlying financial instrument such as a stock or commodity, is going to be trading within a range in the near term. 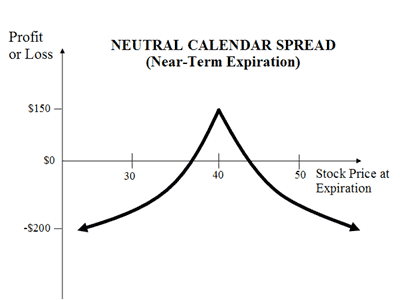 The reason it is called a "calendar" spread is because the fundamental concept is to buy and sell options with different expiration months with the intention of taking advantage of the more rapid rate of option time decay inherent in the shorter term option, compared to the same with the longer term. You buy options with a longer term to expiration and sell/write the same amount of options with the same strike price, but for a shorter expiration period. You should aim to have at least 60 days difference in expiration months between the bought/long and short/sold options. An example would be to sell XYZ call options with say, March expiration dates and buy the same call options but with a May or June expiration month. 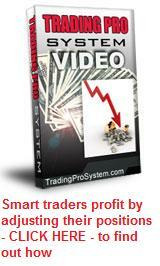 The other important element in the setup is that both your option positions should be "at the money" (ATM). The reason for this, is that ATM options have the most "time value" in the price. If you use "in the money" options there will be a greater intrinsic value factor in the option price, whereas "out of the money" options have ONLY time value which by nature, will be less than their "at the money" cousins due to probability factors. Remember, the whole idea is to milk the time decay from sold options so you want options with the greatest time value component. For those familiar with 'option greeks', theta is greatest at the money. First, you need to identify a stock that you believe will not be trending or too volatile in the short term. Second, you then want to look for these kind of stocks which ideally have a 'volatility skew' between the short term option that you will sell and the longer term option you intend to buy. By 'volatility skew' we mean, that the implied volatility (IV) in the price of your short option should be substantially greater than the IV of your long option. Bearing the above in mind, you should aim to enter the spread with as little debit as possible. $2 per share or less is a good criteria. This also becomes your maximum risk. Under some conditions where IV for near month options is high, you may even be able to enter for a credit. These are the best because they then carry zero risk. Here are three ways that you can easily determine whether a stock is likely to remain within a trading range in the short term. 1. Looking at a chart, you identify lower highs and higher lows following a recent move. Draw a trendline across the lower highs and the same below the higher lows. Then note the angle at which the trendlines are likely to converge. You should look for stocks which have formed their first lower highs and higher lows and which, from your drawn trendlines, indicate that it is likely to remain within that range within the next 30-60 days. It is important to get your timing right here. Should you enter a calendar spread trade too late in the convergence of the trendlines, you may be setting yourself up for failure. Converging trendlines which form a 'symmetric triangle' pattern are often followed by a decisive breakout and at that stage of the pattern, are more suitable to straddle trades than calendar spreads. 2. Identify channels. These are stocks which regularly bounce off parallel support and resistance lines. You only need to identify three points for a channel to be in progress. Once you see this, there is a likelihood that the stock will continue for another month or so this way. That is all you need for this strategy to work. 3. Consolidation following large moves accompanied by a spike in volume. The strong volume tends to "wash out" the buyers or sellers as the case may be, usually leaving the stock to trade within its new range for some time. The preceding large moves often come as a result of market news such as takeover bids, management changes, earnings reports, new products or discoveries and the like. You should look for a stock that has recently moved at least 30 percent in value in one day. Brokers such as OptionsXpress include tools that can scan the markets for these companies for you. Under these conditions, be aware of the importance of option implied volatility, as already discussed, when deciding on whether to use calls of puts. This is where you are most likely to find high IV on near month options. A basic rule to remember though, is that when option implied volatilty is abnormally high, the underlying stock tends to range trade and this is a good place for calendar spreads. Put Options or Call Options? Sometimes put calendar spreads are cheaper than call calendar spreads. The other advantage with put calendar spreads is that if you get assigned the underlying stock at expiration date, there is no risk of having to pay a dividend along with the stock, which can happen with call options. Some of the best option trading systems I've seen combine both call and put options into double calendar spreads. You could simply either sell a new short term option against the long term each month until the premiums received from the sold positions fully cover the purchase price of the bought position. This way, you now effectively own one bought option position with a few months to expiration, for free. This means zero risk. If the underlying stock moves in the desired direction, you can then sell your bought position for a nice profit. If it doesn't you have lost nothing. Buying "at the money" LEAPS options are a much cheaper alternative to purchasing the shares themselves. In the case of call options, instead of paying full price for the shares which 'cover' the short options, you now own options that don't expire until say 15 months away, which give you all the benefits of share ownership for that period. Selling monthly call options against the LEAPS options will give you a long term profit on the basis that "the sum of the parts is greater than the whole". Short term option prices usually have a higher implied volatility than long term ones, due to liquidity and demand. So if you sold 14 monthly option contracts, the 14 premiums received would be greater than the one premium paid for the LEAPS option. An important note should be made here though - this strategy is better suited to long term upward trending stocks and does carry greater risk than normal calendar spreads, because if the price drops below your LEAPS strike price, you run the risk of any new sold option positions exposing you to loss should the price rise again. You should aim to identify an upward trending stock and sell 'at the money' near month call options at the peaks, against your LEAPS option. As the stock retraces, buy them back for a big discount or let them expire and profit this way. In summary, calendar spreads work best when you identify a stock or index that is expected to trade within a range over the next few months. The lower your entry price, the lower the risk. If the stock range trades and you hold the position until the stock returns to the strike price within the last week before expiration, you can often exit with at least 100 percent profit and many times, up to 400 percent. Any wonder they are popular.